Christy Krames‘ image shows the cutaneous distribution (dermatomes) of the trigeminal nerve and color-coded areas of facial sensation. 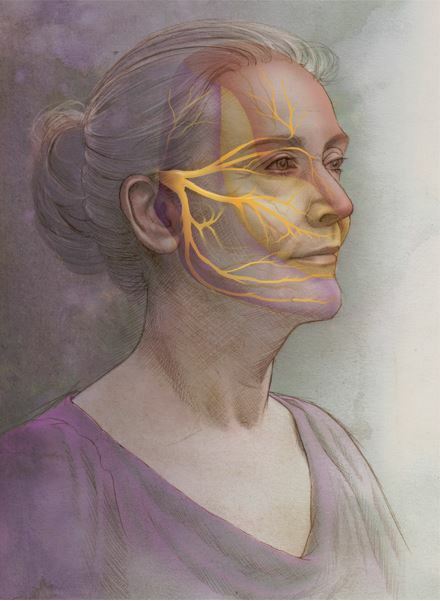 The trigeminal nerve is responsible for facial sensation and motor functions such as biting and chewing and is the largest and most complex of the 12 cranial nerves. A condition known as trigeminal neuralgia affects the trigeminal nerve and is characterized by episodes of sudden, explosive severe pain along the nerve. See more of Christy’s work through her Medical Illustration Sourcebook portfolio and at kramestudios.com.